Leigh H. asks: Why do we call pennies, nickels, and dimes those names? Prior to the United States minting their own coins, it relied on foreign currency. However, that all changed with the passing of the Coinage Act of 1792, which provided the framework for regulating money produced in the United States, as well as established the United States Mint. A little over a month after the passing of the Coinage Act, An Act to Provide for a Copper Coinage was signed into law and the first official U.S. minted currency was slated to be created. Among the forms of currency to make up the U.S. monetary system was the copper cent and the half cent, first minted in 1793. Besides being called by that name, the cent also retained the name penny, borrowed from the name for Britain’s penny which had previously been commonly circulated in the country. As for the British penny, it got its name from the Old English penning, which in turn is thought to derive from the German pfennig. 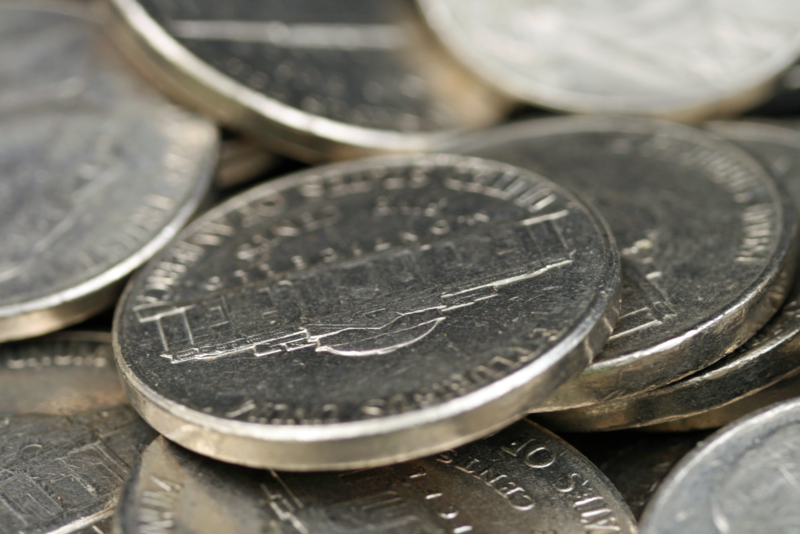 The term nickel has not always been the name for the United States’ five-cent coin. 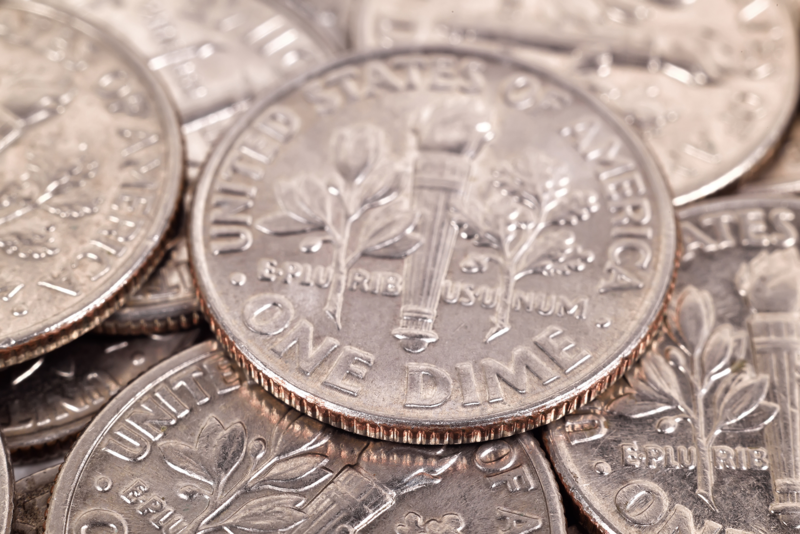 You see, the half disme (pronounced like dime), as it was originally referred to, wasn’t made of nickel. Like the ten-cent coin, the half dime was made of silver and weighed exactly half of the dime, hence half the value. During the Civil War, many metals were needed to support war efforts, resulting in the majority of coins going out of circulation, including the half dime. After the war, a new type of five-cent piece was introduced, one made of a copper and nickel alloy rather than silver. It wasn’t until 1883, after intense lobbying efforts by industrialist Joseph Wharton, that the nickel alloy caught on, replacing the half dime and becoming widely circulated as the “nickel,” named after the metal by which it was made. The dime was technically the first coin made by the United States Mint, but using a borrowed coin machine four years before a Mint building was constructed. However, this dime, or disme as it was originally spelled, was not circulated and the first dime produced by the Mint to be used by the public wasn’t produced until 1796. As for the name, dime ultimately derives from the Latin word “decimus,” which means “one-tenth.” The term disme was used by the French to indicate a monetary value of tenth, and eventually the ‘s’ in the name for the coin was dropped to become dime. Following suit with the dime, the quarter, which was first produced by the Mint in 1796, received its name to indicate its monetary worth as a quarter of a dollar. This was a slightly unusual choice, as using a 1/5 denomination was more common in many currencies. However, at the time the Spanish dollar or peso (equal to 8 reales, thus “pieces of eight”) was widely circulated in the United States. In large part due to this, and perhaps further thumbing their noses a bit at the British, the U.S. chose to design the U.S. dollar to duplicate the Spanish coins, in terms of matching the material and weight, hence value (at the time, the coins were made of silver and valued after the price of silver). Thus, a 1/4 denomination was chosen, instead of a 1/5, to equal two Spanish reales, colloquially known as two-bits, hence why an alternate name for the quarter in the United States was two-bits. The name dollar derives from the word thaler which is an abbreviation for the word Joachimsthaler, a coin type made from silver mined near Joachimsthal (literally “Joachim’s dale”) in Bohemia, first minted in 1519. Eventually the mouthful of a name, Joachimsthaler, was shortened to just “thaler,” and, most notably for the topic at hand, ultimately lent its name to the Spanish pieces of eight, also called the Spanish dollar. 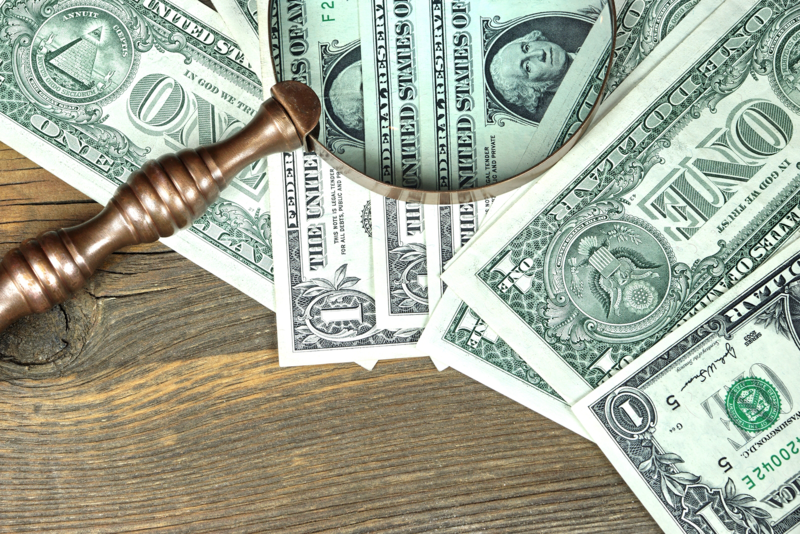 As the U.S. dollar was modeled after the pieces of eight, it was natural enough to borrow dollar from the colloquial name for the Spanish currency. 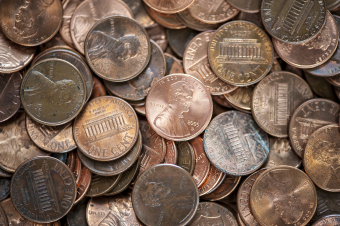 The original face of the U.S. penny symbolized liberty in the form of a woman with flowing hair. It wasn’t until 1909 that this image was replaced with the bust of Abraham Lincoln to commemorate the fallen president’s 100th birthday. Look closely at the back of a penny featuring the Lincoln Memorial and you can see the famous president sitting inside the building. The Thomas Jefferson Nickels were first minted in 1938. The design for these five-cent pieces resulted from a contest held by the United States Mint, the reward being $1,000. Out of the 390 contestants, the winner with the best design was Felix Schlag, a German immigrant who had only been a United States citizen for nine years. As part of his design for the Jefferson nickel, Felix Schlag chose to depict Thomas Jefferson’s Virginia home, the Monticello. Jefferson designed the building himself and construction took 55 years to complete. Unlike the design of the nickel, which was chosen as the result of a contest, the obverse design of the dime that we know today was an intentional act to honor President Franklin D. Roosevelt and his efforts with the National Foundation for Infantile Paralysis, or March of Dimes, which he established when he was stricken with polio in the 1920s. Wanting to do Roosevelt justice, engraver John R. Sinnock was granted the honor of designing the dime due to how he captured President Roosevelt on a previous medal he had worked on. The original designs of the dime and quarter did not include ridges around the circumference. When the United States started minting coins, these two coins were among those made with the precious metals silver and gold. Individuals trying to beat the system for profit would file the edges off the coins, to later combine the metal dust to form additional coins. Even though these coins are now made with cheaper metals, the ridged circumferences are still used today. The quarter has 119 ridges and the dime has 118 ridges around its edge. Not wanting even the smallest suggestion of a tyrannical mindset to be associated with his presidency, George Washington refused the honor of having his visage on U.S. currency. Later on, the tradition that was born out of this became an actual federal law, stating not only that living presidents could not be featured on money, but that a president had to be dead for at least two years before his portrait could be minted on U.S. currency. Although the earliest circulating U.S. coins often featured some representation of Lady Liberty, to date, the first time a real woman was featured on the design of a circulating coin was in 1979 when the dollar coin portrayed Susan B. Anthony. Since then, Sacagawea is seen on the dollar coin (1999 to present) and Helen Keller was included on the Alabama state quarter when it was issued in 2003 as part of the 50 States Quarter program. In addition, commemorative coins have portrayed Queen Isabella of Spain, Eunice Kennedy Shriver, and Virginia Dare with her mother Eleonor Dare on the obverse. The average life of most coins is 25 years, whereas, the lifespan for the average dollar is only 18 months, leading some to push hard for a switch from paper dollars to coins. (For more on this, see: Racking Up Four Million Air Miles for Free- The Dollar Coin Scheme) When coins become too old and worn to be in circulation, the United States Mint recycles them and any usable metal from these coins is turned into coinage strips for new coins. We had the flying eagle cent 1856-1858 with an eagle on the obverse. And then, from 1859 – 1909, we had the indian head cent with an Indian on the obverse. Neither of these was a woman with flowing hair. Albeit both were symbols of liberty and the Indian was a woman with long hair (not flowing).